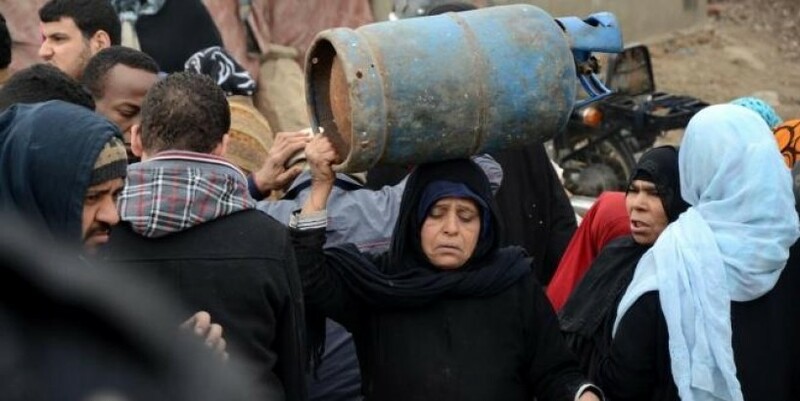 Egypt: Inflation rates increase again reaching 12.2 per cent February 11, 2019 at 3:36 am | Published in: Africa , Egypt , News Egyptian woman carrying gas tank to re-fill (AP) February 11, 2019 at 3:36 am Egypt’s annual inflation rate has reached 12.2 per cent in January, with an increase of 0.8 per cent compared to 11.1 per cent in December 2018. These figures were announced by the Central Agency of Egypt Public Mobilisation and Statistics (CAPMAS) in a statement on Sunday morning, following a steady rise in inflation starting from November 2016, after the liberalisation of the Egyptian pound exchange rate. On 10 May 2018, the Egyptian government raised the prices of subway tickets in Cairo by 50 per cent, 150 per cent and 250 per cent. In June, the prices of tap water for domestic use were increased for the second time in less than a year, reaching 44.4 per cent. Additionally, the cost of electricity consumption for domestic use was augmented by an average rate of 26 per cent to reach 69.2 per cent. Besides, fuel prices increased by 66.6 per cent. On July the 21st, the authorities decided to raise gas prices for both domestic and commercial uses by 75 per cent starting from last August. Hence, at the end of December 2018, the Central Bank of Egypt fixed interest rates at 16.75 per cent for deposits and 17.75 per cent for lending. Millions of Egyptians, who live below the poverty line, face difficulties in meeting daily basic needs following successive increases in fuel, medicine, and transportation prices. Recently, the prices of vegetables and fruits in Egypt have been increasing continuously, prompting the authorities to lower the costs of some alimentary supplies, below market prices, in an attempt to ease their suffering. Compared to the previous month, consumer prices in Egyptian cities have risen by 0.6 per cent in January, after shrinking by 3.4 per cent in December. According to statements by the government, Egypt is expected to cut fuel and electricity subsidies later this year. Thus, the Central Bank has declared earlier that domestic and foreign risks threaten the prospect of consumer prices in the country, about the expected increase in fuel prices, and global interest rates.